All transactions are safe and secure with a reliable history in online purchasing behind each of our associates. Buy the Sloth and Chunk t-shirt to own Goonies clothing and merchandise. 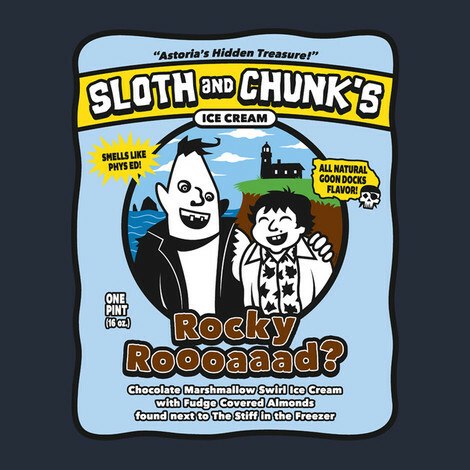 This Sloth and Chunk t-shirt pays homage to the unlikely friendship that develops between the Goonie Chunk (Jeff Cohen) and the deformed Fratelli brother named Sloth (John Matuszak). Chunk treats Sloth with kindness, which is uncharacteristic of Sloth's abusive brothers and mother. The front of this Sloth Loves Chunk Goonies t-shirt features a design inspired by Ben & Jerry's Ice Cream. In addition to the Sloth and Chunk tee above, browse the Goonies Clothing Gallery for more apparel like men's and women's clothes, kids shirts or hoodies.